Artichoke Stuffed Mushrooms | Clare Cooks! Posted on December 24, 2011 by Clare Cooks! I am sure there are some people running around buying last-minute gifts or food, not that anyone I know ever leaves things to the last-minute. If you are in need of a quick appetizer, I would recommend this one. You probably have most of the ingredients on hand and you can have a crowd pleasing snack to munch on in less than 30 minutes. In a large bowl combine the cream cheese, mayo, diced artichoke hearts, garlic, Parmesan, and cayenne. 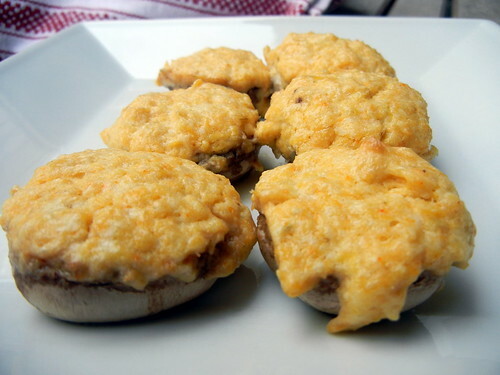 Fill each mushroom cap with 1 tablespoon of dip mixture. Place on a baking sheet (with sides, as the mushrooms will release liquid) and bake for 15-20 minutes, or until mushrooms are soft and the filling is golden. Serve warm. These look super tasty. I might have to try them sometime.